Maria is responsible for ensuring the BID company delivers against it's 5 year business plan. Jill is responsible for the BID projects, communicating with levy payers and handling the contracts with outside organisations. Gurpreet manages the BID’s marketing and communications including the websites, social media networks, PR and promotional projects. Ivana runs the office, manages the BID Board, monitors data such as footfall counter reports and is the first point of call for any BID enquiries. Kwame has worked for Wetherspoons for over 22 years. He joined the company as a cleaner in November 1991 and worked his way through the ranks to Area Manager Role before settling down as the Pub Manager, his preferred role. He has been in his current position for over 18 years. His qualifications include a Bachelor's Degree in Geography and Resource Development and a Master’s Degree in Human Resource Management. Gee Kay Farrar Group Ltd.
Lead from the front at board level assignments and a Founder member of Gee Kay Farrar (Accountants & Business Advisors).Est.1983. Comfortable and fluent in resolving complex financial and business challenges using experience-backed judgment. Energetic work ethic and irreproachable integrity. Respected as a creative and innovative team leader with a ‘can-do’ attitude. Proven track record of taking businesses from humble starting positions to target profitability whilst keeping them aware and compliant with corporate social responsibility. In-depth knowledge of boutique hotel (22 Jermyn Street) industry acquired over a 20 year period as shareholder and financial director. Totally a result orientated individual and inculcate the same spirit in team members. Experienced in managing start-up organisations, developing new markets and putting together and building teams. Gifted with the vision, determination, and skills needed for high-level revenue-building strategies and tactics. Strong orientation towards finance and operations. Expert in financial re-engineering, streamlining and turnarounds. 2 decades of experience in training, motivating, mentor and leading talented professionals. Delivery of accounting and finance for non-financial courses. Gary has over 12 years’ experience in leisure management across private & public sectors. 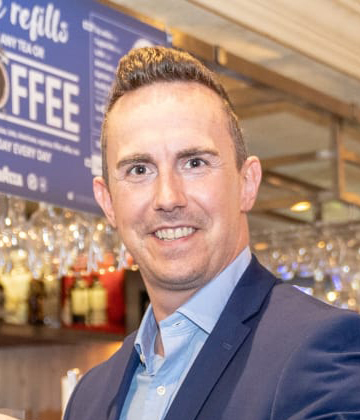 He has held a number of senior management roles including positions at LA fitness and Hertsmere Leisure, He moved to Watford as General Manager in 2015 and was part of the team at Everyone Active who secured a second term contract with Watford borough council. He holds a Diploma in Sports and Leisure Management & is a Member of the Chartered institute of Management of Sport & physical activity. Maria Manion is the Chief Executive. Maria will be responsible for ensuring the BID company delivers against its 5 year business plan. Dan is an Arts Marketing Professional who has worked in London, Newcastle, Hull, Nottingham and now Watford. During his time in Hull he was involved in the forming of the Hull Bid which through the Bid’s support led the city to receiving its Purple Flag award. He also worked on the successful City of Culture 2017 application for Hull. Dan joined the Executive Team at Watford Palace Theatre as Communications Director in 2014. After graduating in Law from UCL, Manny began his career at the Inner London Education Authority and gained a Masters degree in Manpower Planning before specialising in Human Resources and Organisational Development. He later became Head of Education Personnel at Waltham Forrest, followed in later years by promotions to Assistant Director for Education (Birmingham), Head of Personnel and Democratic Services (Thurrock Council) and Executive Director, Corporate Services (Greater London Authority). After a secondment as Interim Deputy Chief Executive at the London Development Agency (LDA), he became the Chief Executive in 2004 where he successfully led the land assembly for the London Olympics. He became Managing Director of Watford Borough Council in 2009. Ansu is a partner at Situls Gift Shop. The store is a family run business and have been trading in Watford since 1976. He went to Watford Boys Grammar School and onto Portsmouth University, to study Accountancy & Finance. After University, Ansu joined the family business and in recent years, has developed a website and focused on online sales. Having lived, studied and worked the majority of his life in Watford, he is proud to be a member of the TCP. Paul has worked for Sainsbury's for over 10 years and prior to that his career involved working in various roles with other leading retailers. Paul has been the Store Manager of the Watford store for over a year and is really enjoy working in the town. Paul believes Watford has a unique community feel for such a large town, and feels proud to be part of the BID at such an exciting time for the town centre. Paul is a skilled retail professional with a vast amount of experience in managing budgets, KPI's and cost lines to ensure he delivers a profitable store. Paul has a lot of experience leading people through change projects and is a great communicator. He is a natural business thinker with great tactical planning skills. Daniel is a Director and Shareholder at Aspect Property Group Limited, a local privately run family property company , where he has acted as Head of Property for the past 10 years. Daniel has been busy buying and managing Aspect's UK-wide commercial property portfolio. The Group has a particularly strong focus on the High Street retail investment market and is currently playing a very active role in a number of projects that are key to the regeneration of Watford Town Centre. Prior to joining Aspect, Daniel was a surveyor at Lambert Smith Hampton for 5 years, a leading UK commercial property and real estate consultancy. Jill Farnsworth is Head of Operations & Development. Jill will be responsible for the BID projects, communicating with levy payers and handling the contracts with outside organisations. Ivana Turner is the BID administrator. Ivana will run the office, manage the BID Board, monitor data such as footfall counter reports and be the first point of call for any BID enquiries.